A “bleeding” plant-based burger which makers claim sizzles, smells and tastes like meat launched in Ireland today. 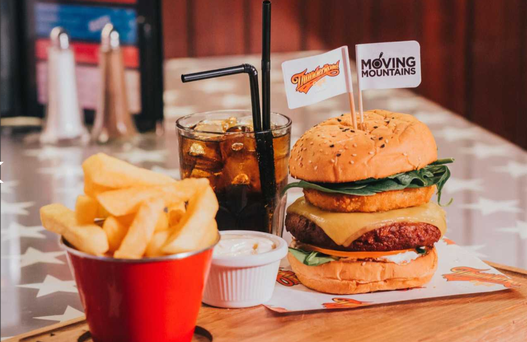 According to Moving Mountains, the burger’s maker, a team of UK scientists, chefs, and farmers have worked for more than three years to create the final product. The burger, which bleeds through the middle with beetroot juice instead of blood, is launching at ThunderRoad Café in Dublin’s Temple Bar. The burger consists of oyster mushrooms which form the base; wheat and soy proteins to give a fibrous texture like a traditional burger; coconut oil for a fatty consistency; and oats for the firm structure of the patty, according to Moving Mountains. It requires less land and water and produces less greenhouse emissions than animal meat. Independent.ie’s food critic Katy McGuinness says these burgers are being produced to cater for a market, and to give diners more choice. Tesco Ireland is stocking the Beyond Burger, another plant-based burger that “bleeds” when cooked, again using beetroot juice to mimic the bleeding of a traditional meat burger.